The helix pomatia is very famous because it is the snail used in the exclusive French cuisine where is called “Escargot”. This species of snail is also known as Roman Snail, Burgundy snail or Apple snail. As we can infer, this snail is edible and highly valued. It has been farmed and it has created an industry to supply restaurants around the world. The Roman snail is classified as a terrestrial gastropod mollusk. The Helix pomatia is an air breathing land snail that has a creamy to light brown shell with darker brown bands. The shell is almost rounded with a width of 1.2-2 inches and a height of 1.2-1.8 inches. They have a single lung and a muscular foot that helps with locomotion. The foot contracts to produce movement and glands within it release a mucus that reduce friction with the underneath surface, reducing risks of damaging their skin. Another important anatomy characteristic is a couple of tentacles in the head. The upper pair is used for vision, while the lower contains smell sensors. 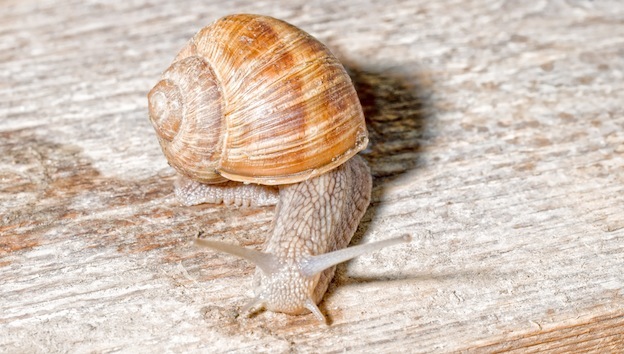 The trail followed by the Roman snail can be easily followed because they leave behind a mark of slime, which actually is the mucus produced by the foot to ease the movement. When a helix pomatia moves above dry surfaces, they tend to reduce the foot contact with the surface to avoid the loose of water. 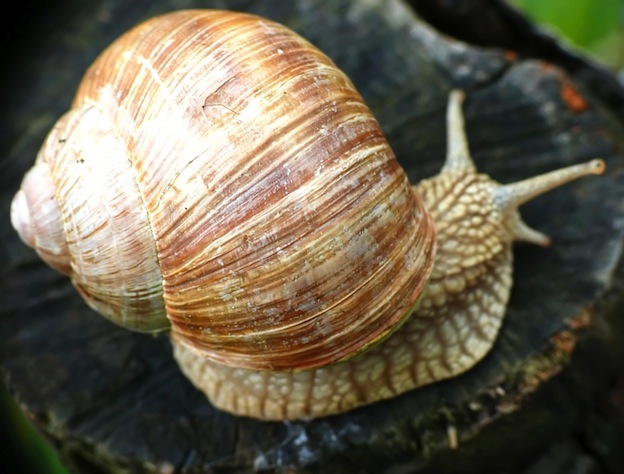 Burgundy snails usually are active during night time, but they can be out on a rainy day or in early mornings, especially if it is a cloudy day. This gastropod mollusk also known as apple snail is native of Europe including countries like Austria, Belgium, Germany, Romania, Sweden, Spain, Ukraine, United Kingdom, Luxembourg and most territories in the continent. However has been moved by humans to Asia, Africa, Oceania and the Americas, where there is a huge industry of snail farming of this and some other edible species. Usually the feeding activity of a Roman snail will be during the night, but you can find them during early morning hours or during rainy days. To scrap their food, the helix pomatia will use an organ inside its mouth with micro teeth called the radula. These snails feed on a variety of plants, vegetables, flowers and leaves. However, they need to consume a considerable amount of calcium to preserve their shells as hard as possible and when they are not able to get it from their food, they will feed on some other materials which contain calcium, even soil or rocks. This snail, as most land gastropods is hermaphrodite; this means that they have both reproductive organs. However, they need to mate with other snails to fertilize their eggs. During the mating process, both snails will fertilize each other making them both able to release eggs. The mating process can last for several hours. During that time, both will exchange “love darts”, a calcareus structure that is injected to each other. Two to eight weeks after mating, they will lay 30 to 50 eggs in holes dug out in the ground with their foot. After 3 to 4 weeks of this, newborn snails will hatch their eggs and will appear out from the soil. It is believed that this process can be repeated from 2 to 6 times in a year, depending on the climate conditions. Roman snails main predators are insects, toads, centipedes, ground beetles, mice and birds, being the eggs the most attacked. One of the major threats their have, is the continuous habitat destruction. However, they are pretty good surviving and are least concern regarding conservation.